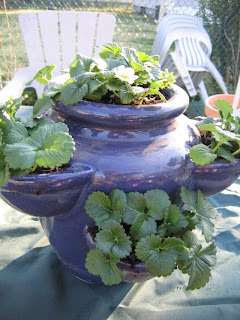 I discovered the strawberry pot I bought a million years ago and a bag of potting mix laying around the house. Then, while I was at Lowes, I saw they had strawberry plants on clearance for a $1. And not the scraggly, dried up plants, but good, hearty plants. The garden beds aren't remotely prepped yet, but at least we've got something planted. I'm so excited! Yeah! I hope your squirrels don't pull them out..mine have been.